If the legendary politician represents anything, it is the productive notion that one can’t repair the past — but one can influence the future. During World War II, the American service that suffered the highest casualty rate was the Army Air Corps — airman were injured or killed at a higher rate than the Army Infantry, and higher than the Marine Corps. As an aviator or crewman, you were a passive target miles above the earth, riding in a thin metal tube that, when hit by shrapnel, had the aerodynamic qualities of a bowling ball. The line between life and death was thin and you knew it. If hit, you were almost certainly going to die. John McCain graduated from the Naval Academy at Annapolis in 1958 and from flight school in 1960. By the time the young Navy pilot began flying missions over North Vietnam and supporting the efforts of young infantry soldiers like me, the situation for aviators had improved, but not enough to prevent McCain being blasted out of the sky over enemy territory in 1967. McCain suffered life-threatening injuries during his crash, only to be captured and then tortured relentlessly for more than five years by his North Vietnamese captors. Much will be made of McCain’s life and legacy these next few days and weeks. The Arizona senator, who died Saturday at the age of 81, served in Congress for 36 years and ran for president in 2008. In the process, he became one of America’s most respected politicians. His military record has always played a role in this legacy, especially his years as a prisoner of war (POW). But recently, some have sought to diminish that record. As President Donald Trump famously remarked in 2015: “He’s not a war hero. He’s a war hero because he was captured. I like people that weren’t captured.” Such comments betray a deep disrespect for the sacrifices of veterans generally and prisoners of war generally. But there is something acutely frustrating about criticism of McCain’s time spent in the infamous “Hanoi Hilton” prison. Aviators receive considerable training in escape and evasion techniques and how to endure captivity, and it is very intense indeed. Still, it is relatively easy to resist — to persist in giving only name, rank and service number and refusing otherwise to cooperate — when you know that the training may be unpleasantly realistic, but it isn’t real. Eventually, it will be over, and you will repair to the barracks and clean up, and then slide over to the club for a few drinks. And then you will go back to doing what you really volunteered to do: fly airplanes. Getting shot down and killed or captured may happen, but it isn’t going to happen to you. It will happen to someone else, and you hope that he was paying attention to the training, so that he will conduct himself honorably in captivity and give the enemy nothing. And then, McCain has said, it does happen to you. And after a flash of disbelief, you realize that it really is you who is shot down and captured, and that you had better steel yourself because the final exam is about to begin. 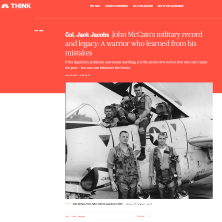 Because McCain was the son and a grandson of Navy admirals, and during his captivity his father became the commander of all U.S. naval forces in the Pacific, the North Vietnamese assumed they could garner some propaganda points by offering to release him. But he refused and continued to resist the inhumane treatment. Until he couldn’t resist anymore. Almost everyone has a breaking point, McCain said later of his torture, and the North Vietnamese reached his. He wanted to be the one-in-a-million person who couldn’t be broken, and since then he has agonized over not being that one. More importantly, he is among the minority of us who are able to come to grips with what we perceive as our personal failings and vow to learn from them. Few others, especially McCain’s fellow prisoners, believed that he had failed at all. But McCain nevertheless was determined to use his terrible experience in captivity to inform the next chapter of his life. It says a great deal about McCain’s character that, years later, he became a highly vocal opponent of extreme interrogation techniques and also championed proper relations with the country whose leadership had been the proximate cause of his pain and suffering. McCain finished near the bottom of his class at Annapolis, and it is unlikely that he studied — let alone retained — the import of Eleos, the Greek goddess of forgiveness, but his deportment reflects a deep appreciation of it. If John McCain represents anything, it is the uplifting and productive notion that one can’t repair the past. But one can influence the future. Retired Col. Jack Jacobs earned the Medal of Honor for exceptional heroism on the battlefields of Vietnam. He also holds three Bronze Stars and two Silver Stars. Jacobs is a member of the Council on Foreign Relations and a military analyst for NBC/MSNBC. His memoir, “If Not Now When? : Duty and Sacrifice in America’s Time of Need,” won the 2010 Colby Award.